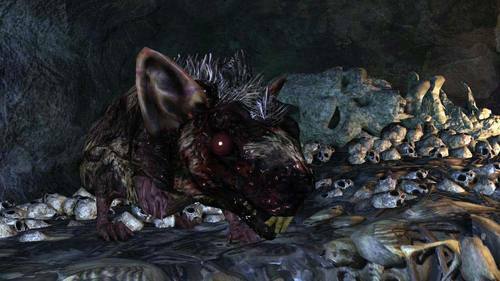 The Rat King is an ancient ruler of the underworld and the leader of the Rat King Covenant. Long ago, he struck an accord with a human chieftain; it was agreed that humans would rule the lands lapped by the sun’s rays, and the rats, all that was below. But the time came when the humans broke their word. They coveted the riches of the rat’s realm and in their greed they hunted the rats down. Tales of the Rat King’s wealth endure to this day, and we are told by Laddersmith Gilligan that if the Rat King is as rich as they say, he might have to pay him a visit. We can only imagine what the Rat King would think of such a character and his transparent greed. It is likely the rats were trying to stop the humans delving deeper into their realm, and so the human’s fought back. For this betrayal, the Rat King never forgave humankind and now sees them all as liars, schemers and cheats. But the Rat King is a noble and merciful being, he understands that honor matters more than gain, and therefore he pities the humans, for they are blind and foolish. Even though the humans broke their accord, the Rat King continued to honor it, and so he remains below ground, only seeking to defend his burrows and realm from any human who would trespass. The Rat King is not alone in his plight, there are many who have come to the aid of this eminently noble being, and this is how the Rat King Covenant was established. Fellow rats, dog rats, mastodon warriors and perhaps even the Gyrm all stand to test one who would seek audience with the Rat King. The Rat King even put in place a trial for the brave to face should they attempt to reach him in the Doors of Pharros or the Grave of Saints. The Royal Rat Authority and Royal Rat Vanguard are both described as living statues who judge or challenge those seeking audience with the Rat King. With such mighty challengers, it is no wonder that only the bravest and strongest will be able to overcome. For this, the Rat King will reward you by allowing accepting your service to his cause. Your story echoes one who came before you. Not all humans shared the sentiments of those who had earned the Rat King’s ire, some may have wished to explore the realms below simply out of curiosity as opposed to greed. One such human came to the aid of the Rat King. The Rat King tells us that the Crest of the Rat was a ring forged by a human who was once among them. The ring was made by a sympathizer with the Rat King’s cause, for it draws to those wearing it any who would defile the Rat King’s burrow. The Rat King will also speak to you of the Lockstones, odd contraptions fashioned by human hand long ago, encouraging you to put these contraptions to employ against your foes. The Rat King’s burrows known as the Grave of the Saints and the Doors of Pharros are both filled with Pharros contraptions. Pharros the Vagabond himself was a legend who wandered the lands, creating contraptions to help those in sincere and dire need. So it would seem from all this evidence that the human who once dwelt among the rats and served the Rat King was Pharros the Vagabond himself. It is never confirmed who the human chieftain was that the Rat King struck an accord with, but we can speculate. Laddersmith Gilligan will tell us that the Grave of Saints dates back to a time long before King Vendrick and Drangleic’s existence. We can also be confident that the Sunken Kingdom too, dates back to a time before Drangleic, as it is all but confirmed that Lindelt was established by survivors of the Sunken Kingdom and Lindelt were worthy rivals to Drangleic in their day (this being just one compelling reason). We can also see in the Grave of Saints, beings of a similar stature to the soldiers in the Sunken Kingdom. It may be that long ago the Sunken King was establishing himself on the surface, but heard rumor of an ancient dragon slumbering far below (interesting to note that the Rat King gives us a slumbering dragon ring). Driven by greed to see the dragon and worship his magnificence, the Sunken King led his warriors into the Underworld, breaking his word and driving the rats from their burrow homes. We know the eventual fate of the Sunken King, drowned beneath a sea of poison, perhaps this was justice for his belligerent crimes? While the Rat King clearly detests those humans without honor, he does have a dream which hints that perhaps he only struck the accord long ago to protect his fellow rats, as opposed to out of distaste for the humans. His dream is that one day, rats and humans may yet live and die together, in peace. Could the humans who broke the accord with the Rat King be the Sunken King and his kingdom of Shulva? It is the only subterranean human settlement we know of. We have no time for thy kind. Humans bring nothing but filth. Is that a Rat Tail, human? Thou'st one of mine rat burrows conquered. This will not go unnoticed. Rejoice, for the right to serve me is now thine. Permit me ask. Wilt thou thy human soul surrender, and pledge thyself to me? Swearest thou by the sweet-tempered sludge that laps at our bosoms? Thou hast the eyes of one who perceiveth true beauty. Take this ring. It was forged by a human who was once among us. The ring draws to thee those who would defile our burrow. Wear the ring whenever thou'rt near. And destroy those who would dare provoke our ire. I will grant unto thee all thou should so desire. I prithee serve with a true rat's honour. Of course. Humans are all alike. Get thee gone. We will tolerate thy stench no longer. I am not unkind. Shouldst thou forbear thy ways, audience shall be thine. Swearest thou to serve me true? Then we need consort no longer. My servant, tell me the way of things. There has been much honour in thy service, despite the human blood coursing thy veins. I am merciful, and trust in thee as I would any rat. The insolent fools line up to trample upon our burrows. My servant, dispatch these invaders, and thy reward will be handsome indeed. Knowest thee of the Lockstones? Those odd contraptions fashioned by human hand long ago. Thou art human, and thence able. I know thy kind, base plotters and schemers all. Put these contraptions to thy employ 'gainst thy foe. Why comest thou here, human? Thy treason will not go unpunished. Be gone. I will gaze upon thee no longer. My servant, do not disappoint me. Traitors will not be forgiven. Get thee gone. My servant, destroy my enemies. I am aware of thine accomplishments, and they are not few. Long ago, I struck an accord with a human chieftain. 'Twas agreed, Humans would rule the lands lapped by the sun's rays, and rats, all that was below. But humans are liars all, schemers and cheats. Thou art from a different cloth cut. Do not disappoint me. Thy deeds are known to me. Still, there is ever more work to be done. Humans are creatures of greed. The time came they broke their word, and hunted us down. I had their word the underworld was ours to rule, untouched as it is, by the rays of the sun. The more humans coveted, the more blinded they became as to what truly mattered. And that is why I pity the fools called humans. My servant, human scent lingers upon thee yet. Rid thyself of it, if thou canst. My servant, well met indeed. 'Twould seem some sunlight-poisoned creatures are worthy of great honour. Thou'st permitted me to dream. One day, rats and humans may yet live and die together, in peace. I will destroy thee, filthy human! Thou art a fool to show thy face here! "Oh, yes, somebody told me that the grave of a… of a saint lies below here. Not built by the King, no no. It dates back to a time long before him. The tomb connects to that hole. And there's…there's…there's something about some…some Rat King down there. Hell, if the old rat is as rich as they say, maybe I should go and pay him a visit!" "You've seen that gaping hole here? Well, there's nasty little vermin down there." King of the rats who dwell in the underground domain. Easily underestimated due to his plain appearance and modest stature, in reality he is a just, honorable, and virtuous ruler. The Rat King harbors a deep and bitter distrust of all who walk the surface world, especially Humans; while this often causes him to give the impression of haughtiness and contempt, he does not bear such ill sentiment without good reason. By demonstrating your loyalty and dedications to him, however, you may be able to restore a measure of his faith in humankind and convince him to open up to you about his past. Ring of the Rat King covenant. Join this covenant and wear this ring to lure trespassers of the Rat King's territory into your world. If you receive this ring, rejoice in the opportunity to demonstrate your allegiance to an eminently noble being. A servant of the Rat King tasked with overseeing the Grave of Saints burrow and testing the worthiness of those who seek an audience with his lord. The loyal rodent can be identified among his subordinates by the dark ridge of fur on his back, perhaps a symbol of his status in the underground kingdom. Soul of the Rat King's Vanguard, of the underground realm. The Rat King's loyal servant judges the worthiness of those who seek royal audience. Use the special soul of this rat to acquire numerous souls, or to create something of great worth. A fringe pyromancy of unknown origin. Creates a powerful cloud of poison mist The poison gradually erodes the target's body, inflicting damage all the while. Whoever created this spell did not believe his enemies deserved a swift death. Corpse-foraging giant rats residing in the Grave of Saints. While at first glance they appear to be no more than putrid vermin, these sentient rodents are in fact loyal to subjects of the noble Rat King and will bravely defend their subterranean kingdom against intruders. It is whispered that those who demonstrate their integrity may be granted an audience with the King and, if deemed worthy, initiated into the ranks of righteous rats. A loyal servant of the rat kind and enforcer of his authority, this gargantuan Dog Rat is also responsible for testing the strength and virtue of visitors to his lord's domain. Soul of the Rat King Authority, of the underground realm. Those who choose to serve the Rat King must have the courage to face His challenges. Use the special soul of this rat to acquire numerous souls, or to create something of great worth. A fringe pyromancy of unknown origin. Sprays an equipment-eroding acid. Does not directly damage foes, but eats away their equipment instead. Yet another pyromancy inspired by perniciousness. Subjects of the Rat King, the origins of theses odd hybrid canine rats remain unknown to all but the rats themselves, They inhabit the doors of Pharros and will bravely defend their realm against intruders. A severed rat's tail. Demonstrate fidelity by offering it to the Rat King, and strengthen the bond with your covenant. The Rat King is proud and merciful, as any king true to his stature should be. The Rat King looks favorably upon those who follow the path of right, even disgraceful humans.